He’d barely learned to walk. As they tango’d and fox-trot’d. He felt the music in his heart. His body knew the tune. That he’d dance round the room. So few will follow through. They’re ours to go explore. As we whirl around the floor. 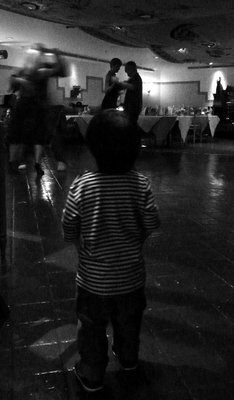 Inspired by our friend’s twenty-month old son J.J. who was mesmerized by the dancers at his mother’s birthday party. Set to the song “Marilyn Monroe” from the musical “Blood Brothers” by Willy Russell, which we saw performed this weekend by Bangkok Community Theatre. Here’s a picture of J.J. with his mother and Uncle Tawn. This entry was posted in Uncategorized and tagged Dancing, Poetry by christao408. Bookmark the permalink. That picture is absolutely precious Chris. I loved the poem too!! Reminds me of “I Hope You Dance”; it’s a gentle, dreamy poem, and I think you should keep it and give it to the boy when he can read. You rarely let the inner poet out to dance! This was delightful. Sounds like a great birthday party. That’s good fun. J.J.’s a cutie. @Redlegsix – @arenadi – JJ’s expression is actually a response to another person that I cropped out of the picture, whose attentions JJ shunned. As for the poem, it is an original. The dancing theme has come across in many ways the past day or two so I think there is some sort of dancing convergence going on in the universe right now. @osmundaregalis – Several of us offered but he’s pretty shy. @murisopsis – Yeah, I don’t consider myself much of a poet. @epiginoskete – Yes, he’s very cute. And I think he’s quite tall for twenty months. @secade – I’ve thought about that; at least when he can read English. @ZSA_MD – Glad you liked it. I don’t write poetry very often. I’m always jealous of people who can dance. The poem reminded me of this kid. @Dezinerdreams – Oh, that’s cute. @TheCheshireGrins – Thanks. @WilldrawsRainbows – Can’t everyone dance? Sweet poem and sweet subject too! I remember my little girls standing on top of their adult partner’s shoes enjoying “dancing” to the music and sometimes dancing solo with a mesmerized look on their little faces. BTW, you should do some more poems. @secade – This isn’t the United States. By now he’s probably doing calculus! @Gma_Joyce – Thank you for the kind words. I don’t think there’s a lot of poet in me save the occasional verse. @marc11864 – His parents do have him on a pretty advanced track for develpment. You’re a poet too? I’m impressed. And he’s incredibly cute.